Emilie was absolutely FANTASTIC! She was always quick to reply. My husband and I are not people who pose in photos regularly and she did such a great job making both our engagement and wedding photos fun with clear and easy directions. She was very patient with us. Engagement photos got back very fast, and the wedding photos took a little over a month to get back to us (I thought it was quick). Beautiful photos, I am so happy with all of them! Emilie was so amazing! She spent time with us getting ready and fit in like we've known her forever. Sean was a great addition to her team as well! He was so helpful from holding the veil and flowers to keeping the men entertained! The quality of every picture is phenomenal! We highly recommend EmilieCarol photography! Capturing the day was one of the most important things for us. Emilie showed up early on the day of and ready to roll. Upon our first meeting I thought she might be too nice to corral my crazy family, but she was on it and able to get everyone’s attention for quick and easy family and wedding party photos! For the engagement photos, we put together a Pinterest board thinking it would just be for inspiration/style. When we received the photos back, it was like she had a photographic memory for the shots we wanted. For the wedding, she ensured every group shot on our list was captured. She has an absolutely incredible eye for photography and was wonderful to work with. We are so glad we found her! I loved working with EmilieCarol! She was so easy to work with and the photos came out beautifully. My husband hates taking pictures so I knew I had to find someone who would be able to get great pictures but would be quick and would not take us away from the party. EmilieCarol was perfect. She was mostly unassuming throughout the event but would grab us a few times if she saw a good photo opportunity during the evening. Thank you, EmilieCarol! 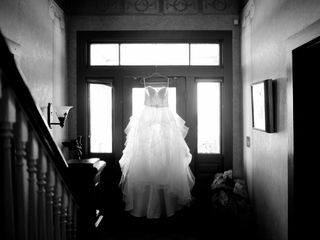 Hurry and schedule an appointment with EmilieCarol Photography! You will NOT be disappointed. Emilie stepped in on somewhat late notice for myself and my fiancé after having a bad experience with another photographer. She was quick to respond, accommodating with our timeline, and a true pleasure to work with. Our engagement photos turned out better than we could have hoped for. She has helped us think through different ideas for the wedding and made such great suggestions already. I cannot wait to see her work her magic on our special day, as I feel more than confident she will do an outstanding job! EmilieCarol took the most beautiful pictures I've ever seen! She kept everyone in line during the family photos, so they could all be done quickly and everyone could get to the party while my husband and I could take tons of gorgeous pictures. She has an amazing eye for framing things, and she really knows how to make people look their very best. She travelled all the way to Richmond for my wedding, and I can't wait for another shoot with her! We couldn't have asked for a better photographer!! She has a great personality and is always on time. We loved the pictures and will enjoy them for years to come. I will be completely honest, to say working with Emilie Carol was amazing [wonderful, fantastic, and beautiful] but those all would be vast understatements. She was beyond patience in times of melt downs with the little ones, and always had a calm demeanor making those hectic moments melt away. She has an amazing talent of helping keep all her subjects stay relaxed and having fun. She is highly flexible and willing to work with you to the best of her ability in cases of having to reschedule. I have never met another photographer whose love for her work is so evident in everything she does. She is dedicated to capturing beautiful timeless memories and I am extremely thankful to have found her and I can not thank her enough and look forward to capturing more timeless memories for me and my family. Thank you so much Emilie Carol! The beauty your soul radiates makes working with you such a pleasure.